This presentation of work by Fernando Botero and others asks how art can urge accountability for human rights in ways that the law cannot. 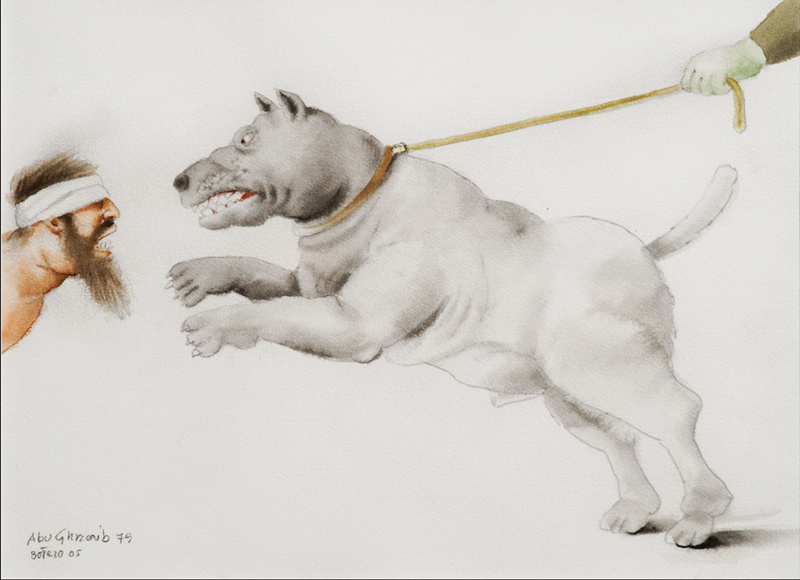 Fernando Botero: Abu Ghraib 79, 2005; watercolor on paper; 11 3/4 x 16 1/8 in. ; BAMPFA, gift of the artist. 11 3/4 x 16 1/8 in. Fifteen years ago this April, photographs taken inside the Iraqi prison at Abu Ghraib became public in what amounted to a shocking disclosure of torture perpetrated by United States military intelligence officers against Iraqi detainees. They pictured prisoners stripped naked, hooded, and threatened by dogs, their dehumanization made more ghastly by American guards appearing casually next to them. While several low-level officers were indicted following investigation of the incident, few others in government leadership have been held accountable, despite disturbing photographic evidence of human rights abuses. With these developments in view, this exhibition asks: How can art urge accountability for human rights in ways that the law—linked with state violence—cannot? Permanent Accusation explores this question in two parts, beginning with an extended look at Fernando Botero’s Abu Ghraib series of drawings and paintings. A Colombian artist best known for his charming, corpulent figures, Botero (born 1932) was part of a global audience horrified by what they learned in published accounts of the events at Abu Ghraib. In response, he began an intensive two-year period of creating artworks of visceral power, participating in a lineage of modern art protesting war and violence. To deepen the impact of Botero’s artistic interpretations, visitors are invited to compare the artist’s work with the original photographs (note: the linked page includes graphic images). Permanent Accusation: Art for Human Rights is organized by Andrew W. Mellon Postdoctoral Curatorial Fellow Elaine Yau.